La Via Campesina TV: International Day of Peasant Struggles 2017 | Call to Mobilise! Esta aquí: Portada del sitio > HIGHLIGHT > International Day of Peasant Struggles 2017 | Call to Mobilise! International Day of Peasant Struggles 2017 | Call to Mobilise! Peasants Rights, Human Rights! Advance toward UN Declaration on Rights of Peasants and Other People Working in Rural Areas! Harare, 23 March 2017: The international farmers’ movement La Via Campesina calls all its members and allies to mobilise on April 17, the International Day of Peasant’s struggles. This year, we want the world to know that peasants and other people working in rural areas have been working very hard for their rights. 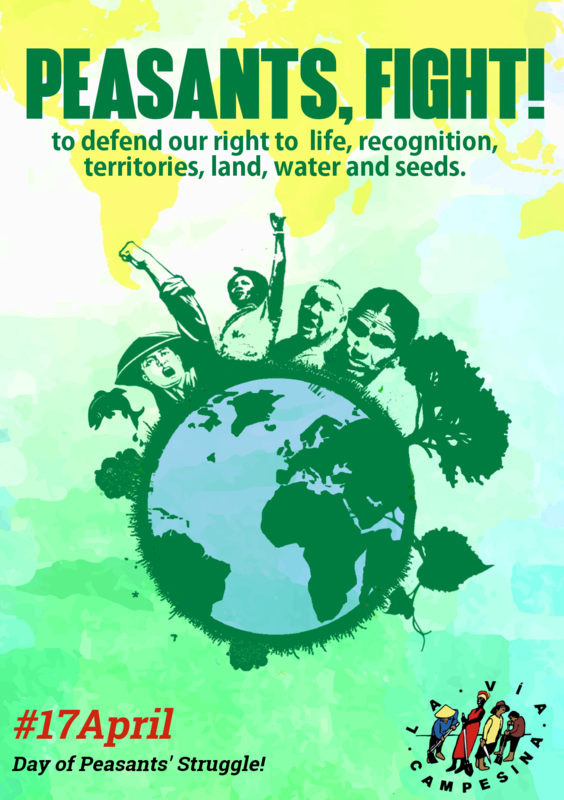 The rights of peasants initiative, which La Via Campesina started 17 years ago, now is in advanced process within the United Nations towards a Declaration on the Rights of Peasants and Other People Working in Rural Areas. This declaration, if approved, will create an international legal instrument to protect the rights of and draw attention to the threats and discrimination suffered by peasants and other people working in rural areas. The need for a UN Declaration on the Rights of Peasants and other People Working Rural Areas is more urgent and evident in the 21st century. Peasants, who produce the bulk of the food consumed globally, continue to face criminalisation, discrimination, displacements and persecution despite existence of numerous international legal instruments for recognition and protection of such rights. Peasants’ basic rights are increasingly very vulnerable as the economic and ecological crisis worsens. This situation is closely linked to human rights violations: expropriation of land, forced eviction, gender discrimination, the absence of right to land and lack of rural development, low income and lack access to means of production, insufficient social protection, and criminalization of movements defending the rights of peasants and people working in rural areas. For instance, in Africa, over 70% of the agricultural production and care-giving is done by women but there is little recognition of their rights in relation to asset ownership, access to credit, information and participation in policy making etc. In Brazil, despite many years of peasants struggling for comprehensive agrarian reform, fair redistribution of land remains unfulfilled. In Europe, the Common Agricultural Policy and market deregulation of the milk sector affect hundreds of thousands of family farmers. In Asia, much as in rest of the world, free trade agreements and bilateral treaties have destroyed local markets and continue to threaten local and traditional ways of farming and farmers’ exchange. Land concentration is increasing as some of the affected farmers are forced to sell their land; youth participation in farming is at its lowest. We call upon the people around the world to celebrate International Day of Peasants’ Struggle by continuing to work to reinforce food sovereignty, the fight against climate change and the conservation of biodiversity; to fight for a genuine agrarian reform and a better protection against land-grabbing; continue to conserve, use, and exchange our seeds; and strengthen the solidarity among ourselves. These give strength for us to defend our land against corporate interest, persecution and violence against peasants and other people working in rural areas. This year in July 2017 in the Basque Country, La Via Campesina will hold its VIIthInternational Conference to deepen our analysis of the current crisis and agree on strategic lines for action to strengthen our movement. We also call upon countries to support the UN Declaration on the Rights of Peasants and Other People Working in Rural Areas. We will mobilise our members and allies to pressure our governments to make the next negotiation in the 4th session of Open Ended Intergovernmental Working Group on rights of peasants and other people working in rural area at UN HR Council Geneva successful. We believe in championing the rights of peasants and other people working in rural areas, humanity also wins. Join us on April 17th by organising demonstrations, pressure to governments, public debates and discussions, film screenings, farmers markets, festivals, or solidarity actions - all of your ideas and plans are welcome! Share by sending to lvcweb@viacampesina.org so that we can capture and circulate them on our MAP of actions ahead of time. Please send us your pictures, audios and videos so that we can upload them on our website and our our TV". It is vital that our rights as peasantry are guaranteed. Access to land is essential for a decent life in the countryside and to realise Food Sovereignty for all the peoples of the world. Watch and share our new video, available here! We feed our peoples and build the movement to change the world! On April 17th, 1996, 19 peasants were killed when military police in the Amazonian State of Pará in Brazil attacked a large number of members of the Landless Workers Movement (MST) who were blockading a highway in order to demand agrarian reform. Two more people died from their injuries several days later, and hundreds of others were so seriously injured that they could not go on working in agriculture. La Via Campesina, which was then in the midst of holding its second international conference at Tlaxcala in Mexico, declared April 17th to be the International Day of Farmers’ and Peasants’ Struggle.